Nothing says summer more than a big, ripe, juicy, deep red watermelon. It doesn’t matter if you’re from the deep south or far north, everyone loves the official “fruit of summer.” My mother was a true watermelon lover. No picnic was complete without watermelon. No summer Sunday dinner was complete, until the watermelon was pulled out of the ice. With one tip of the knife, it’s cold solid mass was popped open to reveal a deep red lusciousness that would soon be running down the chin’s of every child present. The mere presence of watermelon brought on a festive atmosphere. The choice favorite of the time was the Crimson Sweet, a largely stripped melon which was always in the “picnic family” of melons because of its high-sugar content and great flavor. Spitting seeds at the picnic also added great fun and making memories out of simple pleasures. We organically grow the Crimson Sweet here at Delvin Farms for those same reasons. The Crimson Sweet is an old favorite and thrives in the hot summer days nourished by the cool waters of the Tennessee Harpeth River. The Crimson Sweet is a classic favorite whose tradition we proudly carry on. Another summer favorite is the sugar baby watermelon. Delvin Farms chooses to grow the La Mar seedless sugar baby. Its round, dark green outside conceals a deep red, crisp inside. Its small size, up to 12 pounds, is the perfect “refrigerator” melon that can be easily accessed and enjoyed when those watermelon cravings hit. 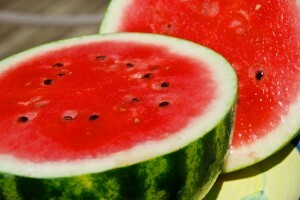 Both varieties of melons grow well in home gardens and will fill the bill for luscious melon flavor. Mama didn’t fancy it up with watermelon salads; the simple fruit was enough for us, but today we take the watermelon into the gourmet spotlight. Here are a couple of ways to prepare the all time favorite watermelon and bring it to the formal dinner table. Place the watermelon in a bowl, top with most of the onions, then the feta cheese. Place remaining onions on top. Sprinkle with balsamic vinegar, and serve. This entry was posted in Market Saturday News, Recipes and tagged crimson sweet watermelon, Devlin Farms, Franklin Farmers Market, watermelon on July 24, 2017 .